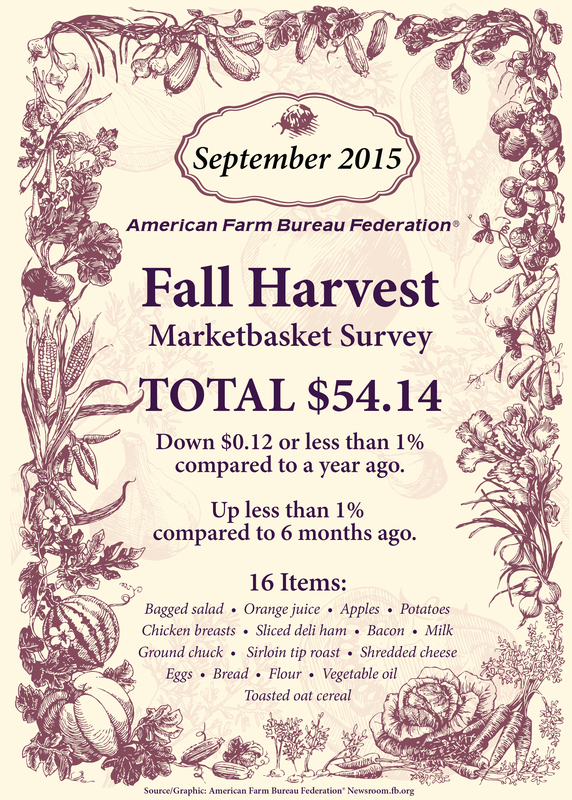 Lower retail prices for several foods, including salad, orange juice, shredded cheddar, ground chuck, sirloin tip roast, vegetable oil, white bread, ground chuck, deli ham and orange juice, resulted in a slight decrease in the American Farm Bureau Federation’s Spring Picnic Marketbasket Survey. The informal survey shows the total cost of 16 food items that can be used to prepare one or more meals was $53.28, down $.59 or about 1 percent compared to a survey conducted a year ago. Of the 16 items surveyed, ten decreased and six increased in average price. “Egg prices are up sharply from first quarter of 2015, a year ago but are down even more sharply from the third quarter of 2015. This shows the effect of the HPAI (High Pathogenic Avian Influenza) event last year,” said John Anderson, AFBF’s deputy chief economist. “Prices soared in the latter half of last year, but are working their way back down as increasing production has started to catch up with demand, which has moderated prices somewhat,” he said. Prices on the beef items in the marketbasket – ground chuck and sirloin tip roast – are lower compared with the first quarter of 2015, explained Anderson. Retail beef prices peaked in early 2015 at record high levels. “Since then, a combination of increasing beef production, weaker exports, and lower competing meat prices have led to modest price declines,” he said. Dairy product prices also remain relatively low. At $4.29 for a one-pound bag, shredded cheddar cheese price is at the lowest price in this survey since the third quarter of 2012. The whole milk price rose almost 3 percent from the third quarter of last year, but that third quarter price was the lowest price in the survey since 2010, noted Anderson. The whole milk price remains well below the 2015 first-quarter price. “Apple prices are up quite a bit year-over-year. This is a reversal of retail prices that were historically low in 2015,” said Anderson. Last year, the apple market faced a really tough export environment with labor disruptions at west coast ports as well as an increasingly strong dollar. “Current retail apple prices are still below some pretty recent years, for example 2011 and 2012,” he said. Price checks of alternative milk and egg choices not included in the overall marketbasket survey average revealed the following: 1/2 gallon regular milk, $2.13; 1/2 gallon organic milk, $4.32; and one dozen “cage-free” eggs, $3.67. Using the “food at home and away from home” percentage across-the-board, the farmer’s share of this $53.28 marketbasket would be $8.52. According to USDA, Americans spend just under 10 percent of their disposable annual income on food, the lowest average of any country in the world. A total of 87 shoppers in 28 states participated in the latest survey, conducted in March. Lower retail prices for several foods, including whole milk, cheddar cheese, bacon and apples resulted in a slight decrease in the American Farm Bureau Federation’s Fall Harvest Marketbasket Survey. The informal survey shows the total cost of 16 food items that can be used to prepare one or more meals was $54.14, down $.12 or less than 1 percent compared to a survey conducted a year ago. Of the 16 items surveyed, 10 decreased and six increased in average price. Higher milk and pork production this year has contributed to the decrease in prices on some key foods. “Energy prices, which affect everything in the marketbasket, have been quite a bit lower compared to a year ago. Processing, packaging, transportation and retail operations are all fairly energy-intensive,” said John Anderson, AFBF’s deputy chief economist. Lower energy prices account for much of the modest decrease in the marketbasket. “As expected we saw higher egg prices because we lost so much production earlier this year due to the avian influenza situation in Iowa, Minnesota and some other Midwestern states,” Anderson said. Price checks of alternative milk and egg choices not included in the overall marketbasket survey average revealed the following: 1/2 gallon regular milk, $2.21; 1/2 gallon organic milk, $4.79; and one dozen “cage-free” eggs, $4.16. The year-to-year direction of the marketbasket survey tracks closely with the federal government’s Consumer Price Index report for food at home. As retail grocery prices have increased gradually over time, the share of the average food dollar that America’s farm and ranch families receive has dropped. Using the “food at home and away from home” percentage across-the-board, the farmer’s share of this $54.14 marketbasket would be $8.66. According to USDA, Americans spend just under 10 percent of their disposable annual income on food, the lowest average of any country in the world. A total of 69 shoppers in 24 states participated in the latest survey, conducted in September.